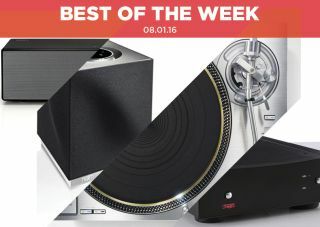 Best of the Week: Samsung 4K player, Technics SL-1200G turntable, Naim Mu-so Qb and more | What Hi-Fi? This week has been full of news and products coming out of CES with Technics’ latest turntable unveiled, the world’s first 4K Blu-ray player now dated and priced and Naim announcing the Mu-so Qb wireless speaker. Elsewhere we had plenty of reviews with Rega's Aria phono amp the best of the bunch. Sony's SRS-X88 wireless speaker and Yamaha's RX-A550 are both deserving of a mention too. It's also new What H-Fi? week with the February issue available to buy. Inside you'll find reviews of Full HD TVs and multi-room speakers, with a guide to purchasing wireless speakers and our revamped Buyer's Guide. Find out more over here, or you can buy the latest issue at your local newsagent or via download. MORE: February 2016 issue on sale now! Technics has unveiled its latest turntable, the direct drive Grand Classic SL-1200G. The name is a nod to Technics’ iconic SL-1200 range, but that's the only connection to its past, with this deck serving as a complete redesign. It features a new ‘coreless’ direct-drive motor, an aluminium tonearm and a number of features intended to keep vibration and changes in rotational speed in check. It will go on sale this summer for a whopping $4000. Several months after it was first announced, Samsung's UKD-K8500 4K Blu-ray player is to go on sale. Connections include an ethernet port, digital optical out, USB port and two HDMI outputs – one each for audio and video. 3D Blu-rays and CDs are supported, with a UHD upscaler on-board too. It will retail for $400 when it goes on sale in the US this March. Naim has announced a second Mu-so speaker, the Mu-so Qb, a more compact and cheaper sibling to the Award-winning Mu-so. Coming this March, the Qb has support for aptX Bluetooth, Apple AirPlay, Spotify Connect, Tidal, internet radio and UPnP hi-res streaming for files up to 24-bit/192kHz. The Naim Mu-so Qb will be available in four colours (black, orange, vibrant red and deep blue) and will cost £595. "If you have a suitably talented deck we think the Aria is a superb buy." Rega is best known for its Award-winning turntables. Now Rega has shown itself just as capable in other areas with its latest offering, the Aria phono amp. The Aria looks unassuming but its performance is stunning, insight, dynamics and rhythmic ability all well served by it. It's a confident all-rounder and one we struggle to find a fault with. As long as your system is up to scratch, the Aria shouldn't disappoint. "There is much to love and much to recommend about Sony's SRS-X88"
Sony has had plenty of attempts to crack the wireless speaker market and the SRS-X88 belongs amongst its better entries. Its sound is spacious and detailed, with a good amount of bass and the potential for a multi-room set-up. Ultimately it falls short of some of its competitors rhythmically, but the SRS-X88 is certainly worthy of an audition. "At this price, there’s a lot of excellent competition that strikes a better balance between specs and performance"
Yamaha's Aventage range tends to be expensive, but the RX-A550 is one of its more affordable efforts. Does it get the balance of specs and performance right? Not as well as we'd like. Yamaha has left out Dolby Atmos, and the unit's performance with music isn't helped by a few timing issues. The big powerful sound we've come to expect from the Aventage is still present, but you can get more subtlety and features from a number of similarly priced rivals.